PageLines DMS Sections are modular extensions based on the PageLines Drag & Drop architecture, and are included in the core DMS. If you are looking for information on configuring or activating sections, please review this guide. Place this section wherever you like and use WordPress widgets and a desired number of columns, to create an instant columnized widget section. Great for Footer designs. When you first add Columnizer to your template, you will need the following default content. This information is here for demonstration purposes and can be replaced by simply adding widgets to a sidebar that has been assigned to Columnizer. Comments are a way for visitors to add feedback to your posts and pages. The Comment Section controls where your comments are displayed. Removing the comments section from any of your templates, will disable comments from this template. Flipper is a posts carousel section and a great way to flip through posts. Simply select a post type and done. The Hero section is a responsive, full width section with a simple headline and call to action. The Intro Unit forces the focus of your visitors onto your featured content, and a call to action with a simple button that directs traffic to any destination. 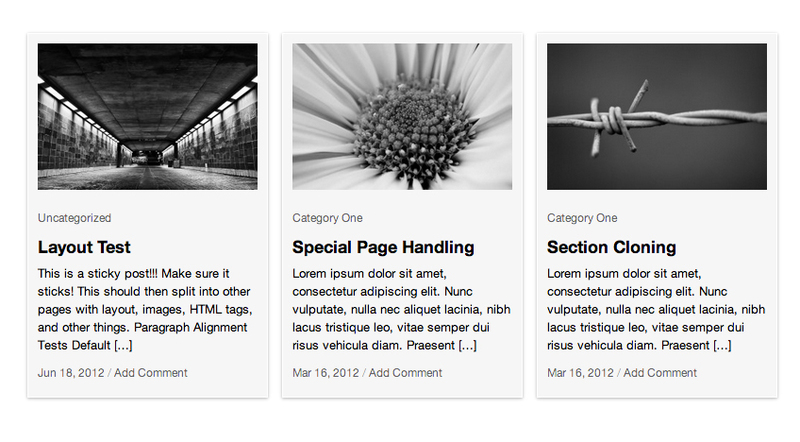 The Highlight Section is a lightweight, flexible section to showcase key content on your site. It works well on marketing and content-heavy sites. An easy way to create and configure several box type sections at once. A quick call to action for your users, enticing or guiding them to engage with your site. 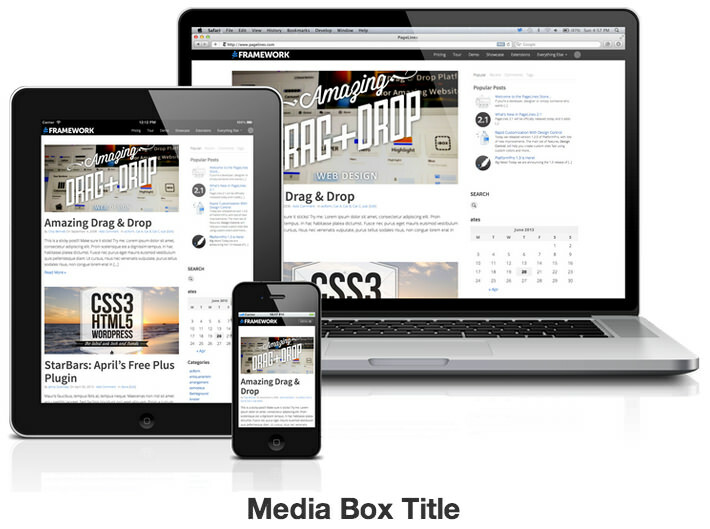 A full width splash and text area. Great for getting big ideas across quickly. It supports options to display menu, multi-color action buttons and display optional blocks of text or code. 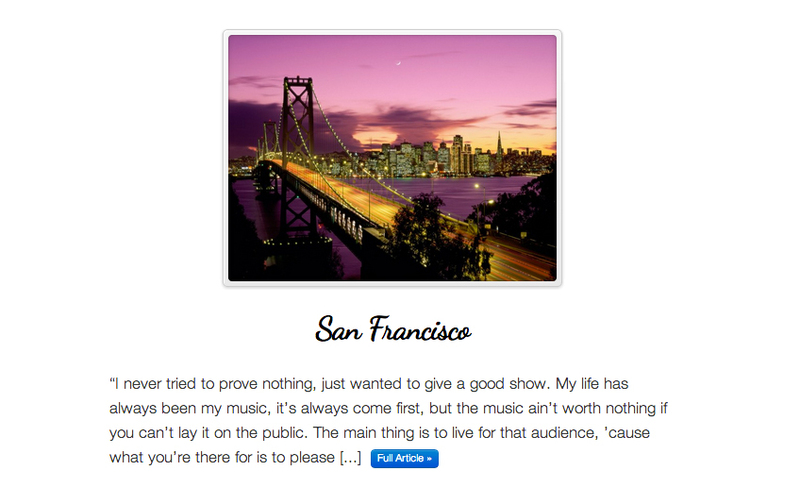 A simple box which supports image, text, html and has viewpoint animation. The NavBar is the attractive, responsive menu, providing navigation and allowing visitors to find the important areas of your site. Pagination is a section that allows your visitors to flip through the pages of posts in your blog, category or archives. When a blog page has more than the set number of posts, a new page is created, and Pagination displays links to it at the bottom of all blog pages. The Postauthor is a section that lets you display the posts created by an author. The Postloop is the area of your site which pulls the post content from the database. It calls the WordPress postloop, displaying such things as the title, excerpt, thumbnail, meta data and content, all created during the process of writing a post. The Postnav is the area that allows you to navigate from one post to the next. Often positioned above or below the Postloop, it displays the titles of the previous and next posts (if any), letting visitors read other content you've published in your blog (posts). 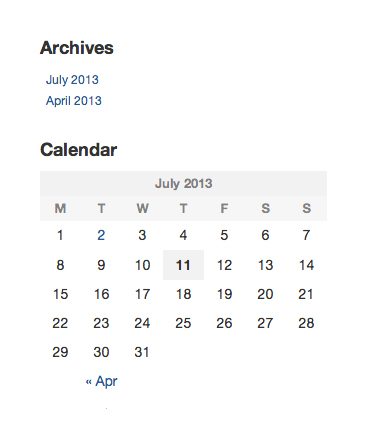 Postsinfo displays information about the posts, such as "Currently Viewing Archives from... ". This helps inform your visitor where they are, and what type of content they're viewing. The Quickslider is a very simple, responsive slider that will allow you to display a series of basic slides, with a link to a post, and its title, and short excerpt. A professional and versatile slider section. Can be customized with several transitions and a large number of slides. This section is the primary sidebar, which is selected via Drag & Drop, and placed upon the site to provide supplemental resources and information to your visitors. The Sharebar Section allows you to share your content from both pages and single posts to the principle social media networks. This creates a supplemental, simple one-line menu without drop-down capacity, used in the footer. A textbox allows you to place text in designated places. Textboxes can usually accommodate HTML, PHP or shortcodes in addition to text. 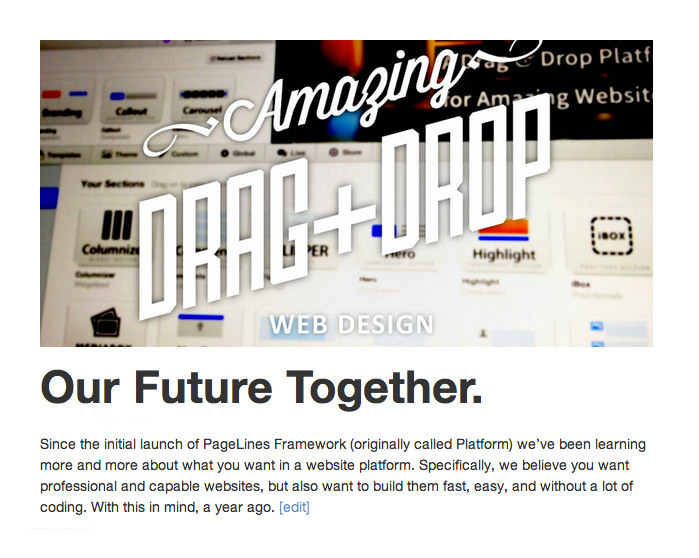 The watermark is by default, the PageLines logo, but it may be replaced with your own logo, or, hidden altogether. The watermark is the last element on the page. Place this section wherever you like and select a widgetized area (configured in admin) for it to use. 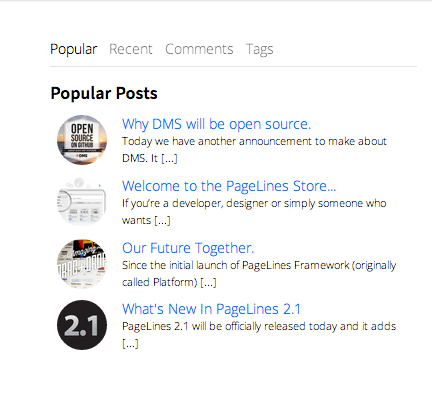 The PageLines Plus Sections are additional extensions available for free to PageLines Plus subscribers. 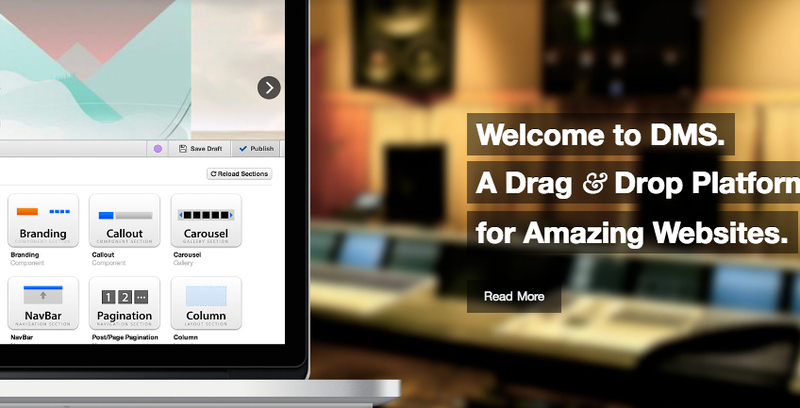 Displays your most popular, and latest posts as well as comments and tags in a tabbed format. StarBars is a collection of animated stat bars that change as the user scrolls. Use them to display stats or other information in an attractive graphical format. The Letters section is designed to replace your blog or other ‘content’ pages with a simple, and extremely readable long form content section. Classic typography uses rules such as proportional line heights, font-sizes and line widths. The Letters section is designed to play by these rules and make for extremely readable, non-distractive content. It is well suited to prolific authors or those who write books online. Similar to Pinterest, the PostPins section displays the post's featured image, title and excerpt, and a link to the post. It displays in columns which can be determined by settings. The Response section is a responsive, scrolling image gallery which is populated by media uploaded to your WordPress Media library. Response is fully compatible with iOS devices, and the image galleries scrolling uses hardware acceleration for that native feel. 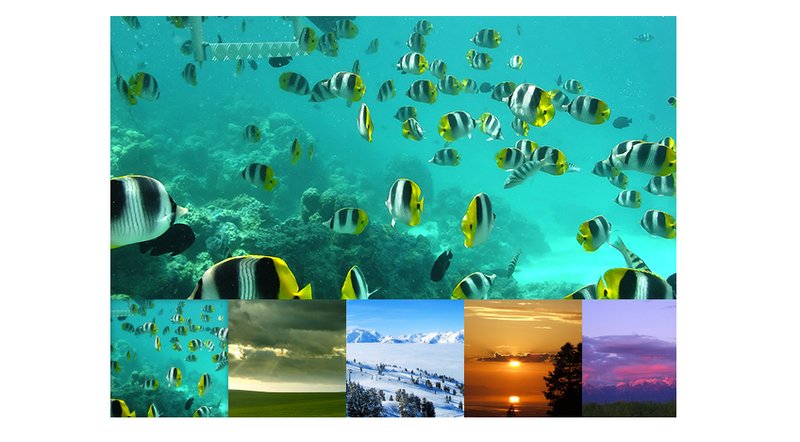 TwinShot is a responsive video gallery best used as a full-width section. You may add up to 10 Youtube or Vimeo videos, and display a menu on the side, with title and a brief description.